Why was the church of Jesus Christ founded? What is the church’s purpose? What does the Bible give as a reason for the church being brought into existence? Jesus Christ said that He would build His church and that the gates of hell, or death, would not prevail against it and so we know the church can not be stopped from existing (Matthew 16:18). The church that I am under-shepherd of is not my church, the church is not the elder’s church or even the members of the congregation, but this is Jesus Christ’s church. He is the Head of the Church and the church is called the Body of Christ (1 Corinthians 12:27, Ephesians 4:12, Ephesians 5:23). The church was founded upon the apostles, prophets and Jesus Christ Who is the Chief Cornerstone of it (Ephesians 2:20). The church was officially founded on the Day of Pentecost after Jesus’ death and resurrection and its creation was only made possible because of the Holy Spirit coming that day and by Jesus purchasing the church with His own blood (Acts 20:28). This is recorded in Acts 2:1-4, “When the day of Pentecost arrived, they were all together in one place. And suddenly there came from heaven a sound like a mighty rushing wind, and it filled the entire house where they were sitting. And divided tongues as of fire appeared to them and rested on each one of them. And they were all filled with the Holy Spirit and began to speak in other tongues as the Spirit gave them utterance.” The word “Pentecost” (Greek, “pentekostos”) means the number 50 and occurred 50 days after the Passover, the same number of days after Jesus’ death on the cross. Jesus gave the church its marching orders and it was given by the Head of the Church, Jesus Christ five times! The main thrust of these commands for the church is found in Matthew 28:18-20, “Jesus came and said to them, All authority in heaven and on earth has been given to me. Go therefore and make disciples of all nations, baptizing them in the name of the Father and of the Son and of the Holy Spirit, teaching them to observe all that I have commanded you. And behold, I am with you always, to the end of the age” and Acts 1:8, “But you will receive power when the Holy Spirit has come upon you, and you will be my witnesses in Jerusalem and in all Judea and Samaria, and to the end of the earth.” We see that the church’s purpose is the Great Commission of proclaiming the gospel of Jesus Christ to all the world. That is one of the main purposes of the church. 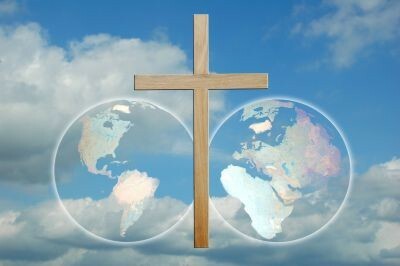 The church is actually commanded to share the gospel of Jesus Christ and to take it into all the world. We are to be His witnesses “to the end of the earth,” across the globe and across the street. We have already read that the church’s purpose is to proclaim the gospel to the ends of the earth and is also commanded to assemble together on a regular basis. The writer of Hebrews says in 10:25 to “not [be] neglecting meeting together, as is the habit of some, but encouraging one another, and all the more as you see the Day drawing near.” If you think that living the Christian life is a solo act, you could not be more wrong. Just a quick reading of 1 Corinthians 13 and Romans 12 shows how this is impossible to do on your own. We are commanded to assemble together for one another, to grow in grace and knowledge, and to spur one another unto good works for the glory of God (Hebrews 10:24). Purpose of the Church: To glorify God and to take the gospel into all the world. Another purpose of the church is to glorify God. How so? First Peter 2:12 is clear about this as he wrote, “Keep your conduct among the Gentiles honorable, so that when they speak against you as evildoers, they may see your good deeds and glorify God on the day of visitation.” Jesus said in Matthew 5:14-16 “You are the light of the world. A city set on a hill cannot be hidden. Nor do people light a lamp and put it under a basket, but on a stand, and it gives light to all in the house. In the same way, let your light shine before others, that they may see your good deeds and glorify your Father in heaven.” The church is to glorify God and that is one of the main purposes of mankind but it is also the purpose of the church. The church is to glorify God collectively but also individually by ascribing worth to God in all things and giving thanks for all things. Paul wrote to the church at Philippi saying, “And it is my prayer that your love may abound more and more, with knowledge and all discernment, so that you may approve what is excellent, and so be pure and blameless for the day of Christ, filled with the fruit of righteousness that comes through Jesus Christ, to the glory and praise of God” (Philippians 1:9-11) and also wrote “whether you eat or drink, or whatever you do, do all to the glory of God” (1 Corinthians 10:31). The New Testament is clear that the purpose of the church is the same purpose for which we were made: To glorify God and to take the gospel into all the world. These are the chief ends of mankind and the church and we can glorify God by living our lives as Christ did, by loving our enemies, by sharing the good news with the lost, by loving one another, and by our good works which will glorify God. We must also be certain to ascribe to the Lord the credit for all the good things we have. When something good happens to us we should always thank God for it and tell others that it is God Who is most worthy to praise and ascribe credit too. Nothing happens outside of the sovereign will of God. Even bad things work out for our best (Romans 8:28). Acknowledge Him in all things. God says “I am the LORD; that is my name; my glory I give to no other, nor my praise to carved idols” (Isaiah 42:8). In worship songs we should, “Sing the glory of his name; make his praise glorious” (Psalm 66:2) because, “apart from [God] there is no savior” (Isaiah 43:11b) so, “In all your ways acknowledge him, and he will make straight your paths” (Proverbs 3:6). That is our purpose and also the purpose of the church that Jesus Christ built. Very good view of the Lord’s intentions and purposes for the church, the body of Christ. In your view, why do you think the church has moved so far from God’s purpose and calling? Why do you think the church has grown so weak in these essential elements? Thank you so much my good friend, Geno. That is a great question and this shows me that your heart is bent toward obedience and pleasing God. Truly, in my opinion (errant as it is), I feel we are living for the world and so steeped in it. I visit nursing homes, go into the streets, vist the sick and injured in the hospital (church members or not), and try to be the hands and feet of Jesus but even the church I am under-shepherd of does not want to go with me. I believe we are in the Laodicean era of the church and that many are so lukewarm that they are being underground Christians and only want to get into their “holy huddles” and many pew potatoes are here…many tares mixed in with the wheat. It grieves me that those even in my church will not go with me. Someday they will have to give an account to the Lord. I pray the Holy Spirit brings revival to them for only the Holy Spirit can convict them of these sins of omission. Does this seem right sir? I thank God that men of God like you care enough to even ask that question Geno and for which I thank God for you brother. Thanks so much for your gracious response to my comment, Jack. It’s interesting to me that you said, “I believe we are in the Laodicean era of the church and that many are so lukewarm…”, because, just two days ago I posted an article about this very subject. Geno, as I commented on your website, this is about as fine a work I have ever read on the Laodicean church. You are spot on brother about the Pentecostalism being man-centered. I call it “me-ology” and not theo (God) logy (study of). I truly think this is one that I would like to, with your permission, put on my own personal blog my friend. It is just that good. What happens is that we are so focused on us and our gifts that its like they are almost worshipping a gigantic tongue at the altar. Where is Christ and the fruits of the Spirit spoken of. Jesus said that they will know you by your fruits…not gifts. These churches need to talk about repentance, confession of sin, the cross of Christ, obedience, sanctification, preach expositor Bible preaching. Love it! Sterling work Geno. Jack… Thanks so much for investing the time and visiting my site, and for your very encouraging comments. Amen my good friend. Thank you for visiting us Shilpa. Wonderful view for the Church. Though sometimes the church get through shakening. He (God) will always find find way. For He alone can stop storm and calm the see. Please pray for our Church. I think we are under trials right now as a church. But I believe God is the Head of our Church. With all my heart I know He will come upon and touch every hearts in our Church and make us humble before Him. And on that day He will healed the broken hearts and we will all together worship the Name of GOD in spirit and in truth. Thank you Joel. The church I am under-shepherd of now is also falling apart. They are not consistent in attendance, do nothing in Outreach or evangelism (save 1 person) and they are sometimes even on Facebook while the sermon is given. Let us pray together for each of our church’s so that God will send revival to them and for Jesus’ glory, amen. Thank you Ptr. Jack I really believe that you too had pray for our church. Just want to share the you what is happening right now in our church. Two Sundays ago there a was rival happens in our church. Though I am so sad but I am so blessed for our Ptra. (whos her attitude become a great issue in our church resulting to some of members to stumble) really humble herself and made an action that suprise us all. I believe her action is a reasult of her obidience to God. I feel that she really fear God that she did whatever God had commended her to do. So far she is okay and have a good followship with us now. I hope and still pray that this changed in her life will continue until the coming of our Lord Jesus. I’ll always hold on to what the bible says in Galation2:20 “I have been crucified with Christ and I no longer live, but Christ lives in me. The life I now live in the body, I live by faith in the Son of God, who loved me and gave himself for me.”. If this verse will happens in every church that everyone will wholeheartedly deny themselves and live fully to what Lord has required. I believe God will always be with us. Thank you for prayer. I’ll continue to pray for your church and for you Ptr. Jack. God Bless! Wonderful to hear Joel. I am so blessed by your response. There is no power in me but in the mighty, strong name of Jesus there is real power indeed and to Him be the glory Joel. Thank you sir for your encouraging words. I know it has been a couple years since this post but may I encourage an addition to the proposes of the church. You have the great commission but i think adding the great commandment. Love the Lord your God with all your heart, soul and mind; and love your neighbor as yourself. True love is followed by actions, so how do we then love our neighbor, we are servants to them even as the Son of Man was a servant to those in His time. We are in active ministry to the needs they have and in this way we are reflecting the light of Jesus! I am sure you could state this in a far more eloquent way than I am able but EVERYONE is a minister, and God has built into each person a special combination of personality, experiences and gifts to fulfill the ministry He has called you to. Thank you Mr. Radlinger. Very well said sir. You are spot on and that was an oversight of mine and thank you for adding that essential command my friend. Well said. I have to admit that sometimes we get caught up in what is going on around us and so we begin to take our lead from the world instead of how God has asked to be be and how to lead our lives. Sadly the church is allowing elements of the worldly agenda to creep in and pollute the true teaching of the bible. We must have more faith pertaining to the word of God and his purposes for us as revealed in his holy word, thr bible.